It is the first non-sensacionalist and serious post I read on this topic. Although, I found it somehow contradictory. Your main statement is that all the history is cyclical. Why this fact would make AI weaker? Isn’t it your future forecasting obtained from “the data from the past you collected”? ANSWER: The computer can determine the cycle from all the collective data interlaced from around the world. It can forecast turning points decades in advance. But that does not mean it comprehends what the future really is as to a human being. It may seem to be a subtle distinction, but it is the difference between a computer and a conscious being that also knows it has a shelf-life and will grow old and die. I am working hard to deliver Socrates because I have a shelf-life. It is the only way to allow such research to continue beyond my life-span. I do this for posterity for it has taught me so much. It will most likely only be recognized by mainstream after my death and then they will try to discredit it by crafting stories about me personally attacking the creator because they cannot dispute the research Socrates reveals. That is simply how human nature operates historically. Someone one day will quote this very line I just wrote. That is inevitable. Welcome to humanity. The concept of the future is hard to express in words but I can say to you, ” let’s go to dinner next Tuesday.” You can conceptualize the future and say yes or you will be busy and say can we make it Wednesday? That is a dynamic conception laced with many aspects in our mind. A dog has no concept of tomorrow. A computer can project turning points into the future from the past, but it does not have a concept of the future. It is simply just math – very black and white void of emotion. There is another hidden order of dynamic multi-dimensional structure we do not understand yet with the human mind. The formal link between neural network structure and how the brain actually functions in processing information does not truly exist and anyone claiming to have some neural net to predict the future is just nonsense. Those claiming to have created AI programs using a neural net to forecast markets is more-likely-than-not just a consumer fraud or simply another model destined to fail. We do not yet understand neural networks in our own brain so we cannot duplicate it in programming. On top of that, neuroscientists have used a classic branch of math in a totally new way to peer into the structure of our brains. What they’ve discovered is hard for us to even visualize that the brain is full of multi-dimensional geometrical structures operating in as many as 11 dimensions. We live in a 3-D world perspective. We are not yet capable of understanding how there can be 11 dimensions all interacting. What is the structure? How does this even function? The results of this new study is the next frontier in trying to understand the fabric of the human brain, which somehow is the machine used by our mind that is our consciousness distinguished from the brain itself. The human brain, by the way, is the most complex structure we know of no less an amazing super-computer. And someone wants to claim they have an AI computer neural net to forecast markets? Good luck with that one. How can you create a neural net we do not yet understand to forecast something that is so complex, it defies description? If we do not yet understand how such a neural net functions in our own brain, how can you write as computer program to mimic such a neural net? How can some neural net suddenly evolve and become conscious if we do not even understand the structure at the core level? This latest brain model was produced by a team of researchers from the Blue Brain Project, a Swiss research initiative devoted to building a supercomputer-powered reconstruction of the human brain. They used algebraic topology, a branch of mathematics used to describe the properties of objects and spaces regardless of how they change shape. They found that groups of neurons connect into ‘cliques’, and that the number of neurons in a clique would lead to its size as a high-dimensional geometric object (a mathematical dimensional concept, not a space-time one). We live in three spatial dimensions plus one time dimension, which we have yet to fully understand as well. Here, the 11 dimensions are how the neuron cliques are connected. Networks are viewed in a structure in terms of groups of nodes that are all connected, which is known as cliques. 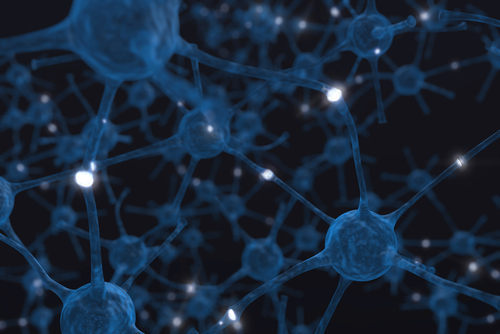 The number of neurons in a clique determines its size or dimension. The human brain is estimated to have 86 billion neurons, which is a stunning number in itself. These then have multiple connections from each cell webbing in every possible direction. This structure forms a vast cellular network that somehow makes us capable of thought and consciousness that we do not understand. The Blue Brain Project team focused on the neocortex, which is thought to be the most recently evolved part of our brains, and the one involved in some of our higher-order functions like cognition and sensory perception. Algebraic topology provides mathematical tools for discerning details of the neural network both in a close-up view at the level of individual neurons, and a grander scale of the brain structure as a whole. Connecting these two levels, the researchers could discern high-dimensional geometric structures in the brain, formed by collections of tightly connected neurons (cliques) and the empty spaces (cavities) between them. What they discovered was amazing structural dynamic complexity, which is really what I discovered taking place with the interconnections globally within the world economy. “It is as if the brain reacts to a stimulus by building [and] then razing a tower of multi-dimensional blocks, starting with rods (1D), then planks (2D), then cubes (3D), and then more complex geometries with 4D, 5D, etc,” according to mathematician Ran Levi from Aberdeen University in Scotland. What I find so fascinating is that the very same structure emerges at a higher level whereby all humans interact globally in the same manner dynamically shifting and reorganizing structures. What they have discovered I see in the development of Socrates but at a higher level suggesting this is indeed fractal in nature. Socrates is now beyond 150,000 possible daily patterns in the Global Market Watch. This is just stunning. 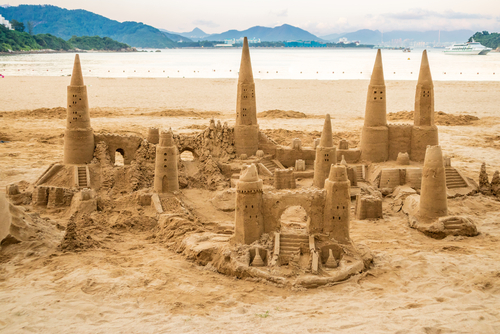 It is like building a sand castle on the beach creating an elaborate structure which is washed away by the sea in the morning. Both in our mind and within Socrates, we have human thought and action capable of creating dynamic structures to solve or react to some event and then vanish awaiting the next problem to rebuild a completely new structure. This multi-dimensional ability to respond to stimuli is just amazing. I see this is capital flows on a grand scale – ever shifting creating new trends and structure. Tracking this dynamic interlaced structure of the entire world is the same with these 11 dimensions in our biological brain. How do we dream in concepts that are very imaginative abstracts of reality? 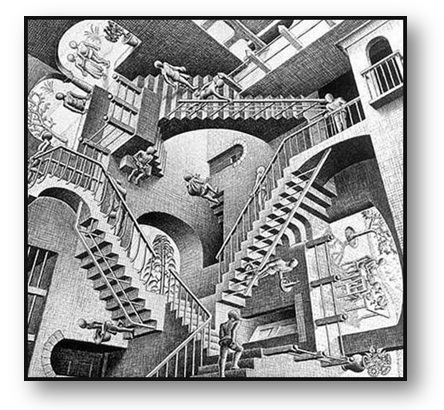 We can imagine in a dream concepts and objects that could not exist in the real world like the drawing above that could not exist in reality. We know that the rear portion of our brain gets pretty active during REM sleep, when most dreaming occurs. Some believe that it’s just the brain winding down for the night and that dreams are random and meaningless firings of the brain that we don’t have when we’re awake. There is simply no answer to the question: Why do we dream? I can personally attest to it is not random nor is it just meaningless firings of the brain that we don’t have when we’re awake. There have been complex problems I have thought about with no answer when awake. Yet it is “on my mind” still when I sleep. Suddenly I have woke up in the middle of the night saying “eureka” that’s the answer. This has happened way too many times to support a theory of meaningless randomness. Take this picture of a girl in the water. Your mind will fill in the blanks as to what you think she looks like. Your mind will create an image that pleases you yet you have not seen her (her picture is at the bottom). Why does the mind fill in the gaps? To the right is another famous drawing. How old is the woman that you see? Is it the mother-in-law or the pretty girl. Which did your mind see first? 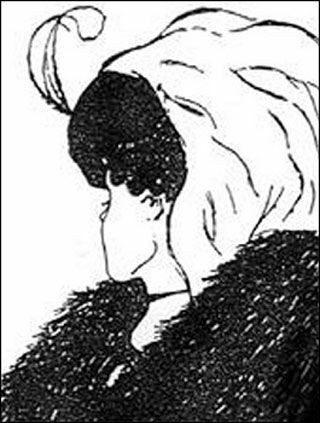 The mother-in-law with the big nose looking down or the young girl wearing a necklace turned away? Here is another famous drawing. What animal do you see? 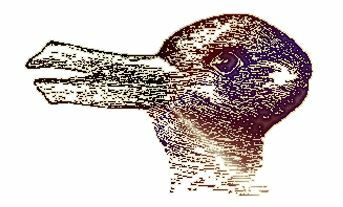 The duck with its beak slightly open or the rabbit with its ears pointing to the left? Our mind is capable of creating images from fragments. To add to all this stunning complexity, we can access data we have stored in our brain for decades from all the five senses. You may hear a song and that will access some event in our past where you perhaps had dinner with someone you fell in love with at least temporarily. Then again, you may return to the place you had that event and suddenly remember that dinner. You might have had some food that night and suddenly you will remember that same event. We can access a memory from any of our senses for our brain is recording everything even if we do not realize it. There is significant evidence demonstrating that we possess “core object recognition” which is the ability to rapidly recognize objects despite substantial appearance variation. Our brain will engage in reflexive feed-forward computations which will produce a powerful neuronal representation in the inferior temporal cortex. Precisely how our brain creates an algorithm that produces this solution remains a mystery. Nevertheless, we have evidence ranging from individual neurons that build into neuronal populations creating a behavior evolving into computational models. We seem to dynamically create computational models, each based on building blocks of small, canonical sub-networks with a common functional goal. Our sand castles that dissolve and then regroup to solve the next problem. So sorry, I do not buy that consciousness will suddenly emerge and a computer will be endowed with an evil soul out to rule the world. In my opinion, the complexity is far too extensive for us to understand how our own mind works yet in order to build some neural network that will turn against us. My suggesting is that Elon Musk and crew should stop worrying about AI and start to try to comprehend what we are all about first.